Your wedding day is such a very special day! 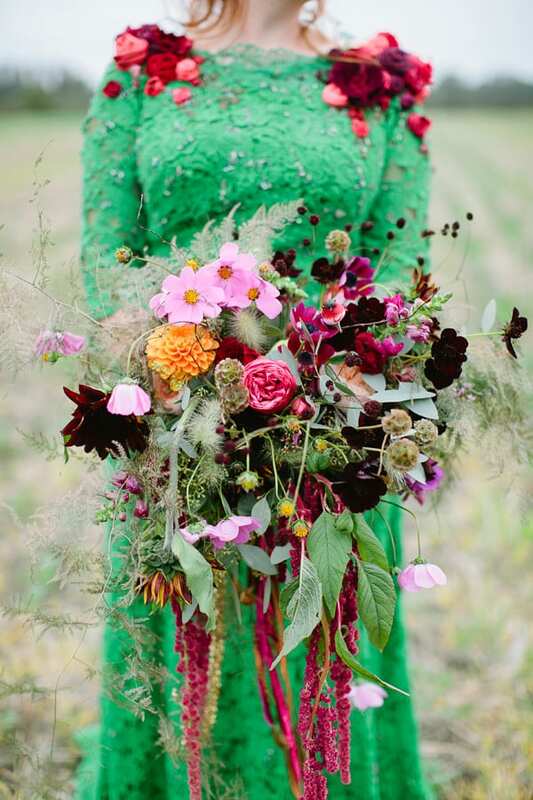 And it occurred to me recently… when you’re a florist getting married, how do you go about choosing your flowers and deciding on the floral style for your big day. Do you do all the flowers or do your draft in helpers? 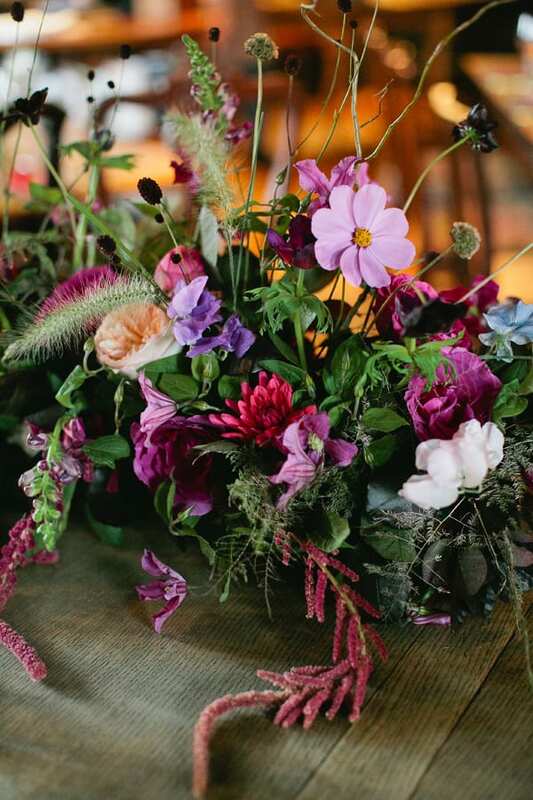 Well, in this week’s Wedding Wednesday blog post, I’m delighted to feature an interview with florist Jay Archer from Jay Archer Floral Design together with photos from her wedding, which took place last September. ‘I wanted something natural and different to what I make every day at work, but in keeping with the venue and allowing for long tables. The October before we got married, we toured the South of France on a motorbike and whilst walking in a public park, we were caught in the rain. We took shelter under a huge oak tree and looking back out at the carefully tended borders, we noticed the planting. Although well-maintained, the borders were very wild in style and beautifully bright. 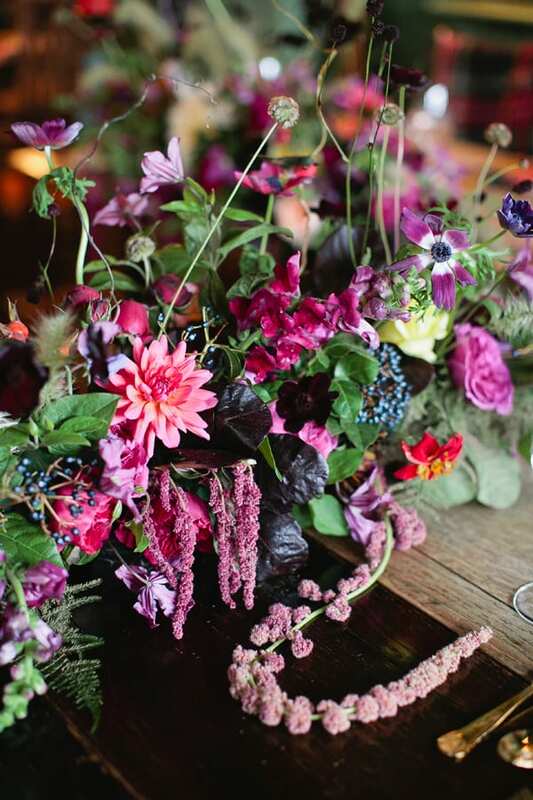 There were endless varieties of flowers, in pinks, purples and reds. 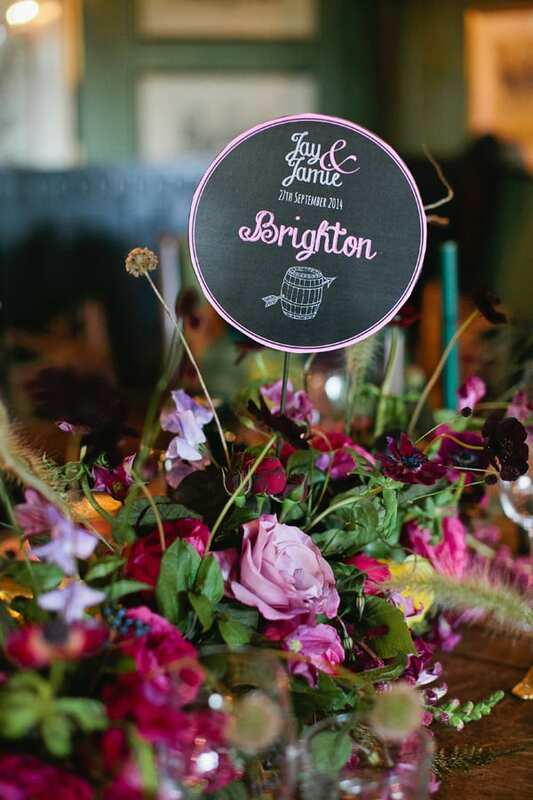 And I thought…that’s it, that’s our wedding table design! 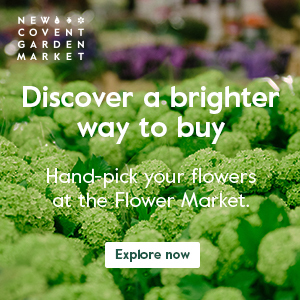 I didn’t want to use oasis trays, so we hollowed out birch logs from GB Foliage at New Covent Garden Flower Market and filled them with flowers! They worked a treat in the space and Jamie even mentioned them and the trip to France in his speech. 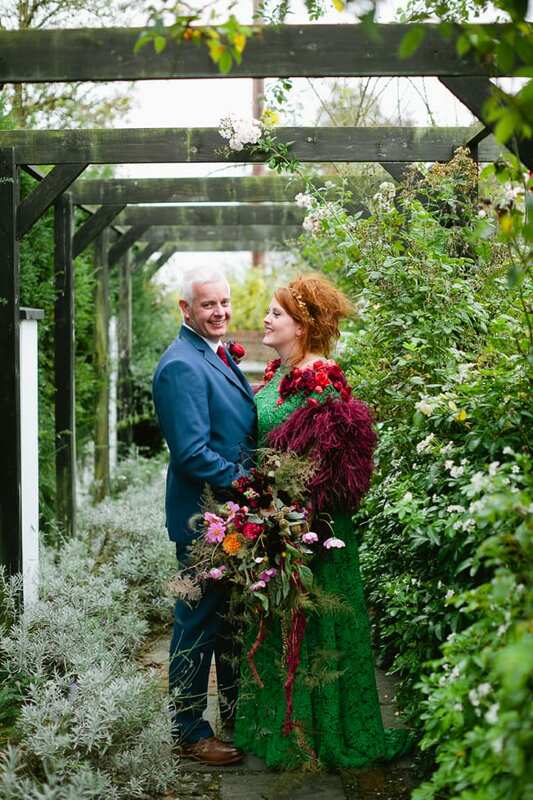 We used homegrown Sylvia, Cafe au Lait and Red Runner dahlias, red sunflowers, cosmos, chocolate cosmos, rose hips, cotinus, setaria grass, roses, viburnum berry and foliage, imported sanguisorba, snapdragons, sweet peas, clematis, astrantia, scabious seed heads, amaranthus, anemones, asparagus fern, Juliet David Austin roses and Piano roses. I did feel pressure to have nice flowers, as everyone kept saying they couldn’t wait to see them! At first, I decided I wasn’t having any but inevitably they ended up all over the place…even in my hair! We just went with the flow though and didn’t bow in to pressure. I made them myself. I couldn’t have let anyone else do it! 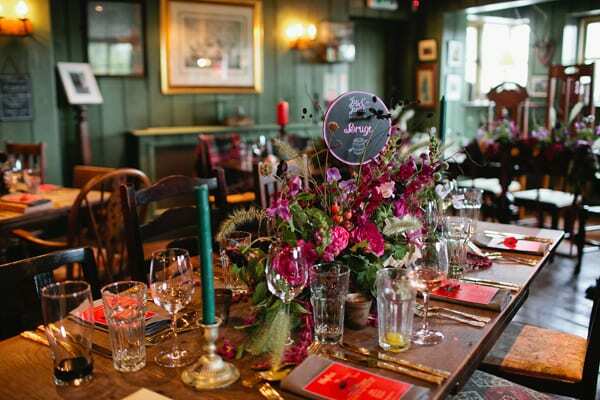 But we only had six tables and no bridesmaids or big displays, so it was straightforward enough. 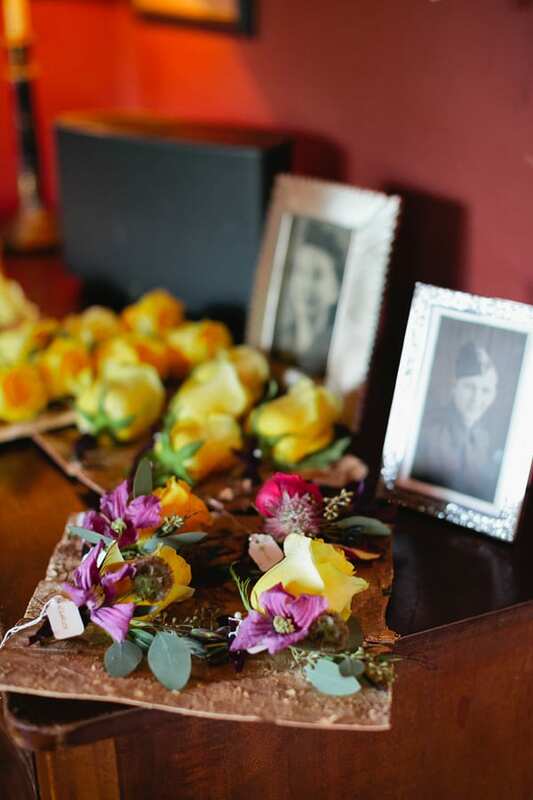 My team did make the buttonholes for all the guests, which were yellow roses as a nod to my grandad (a favourite of his), and the five centrepieces after I made the first demo one. Colour-wise, I knew that I wanted brights and Jamie wanted the Sylvia dahlias from our garden, as he has always loved their geometric shape. 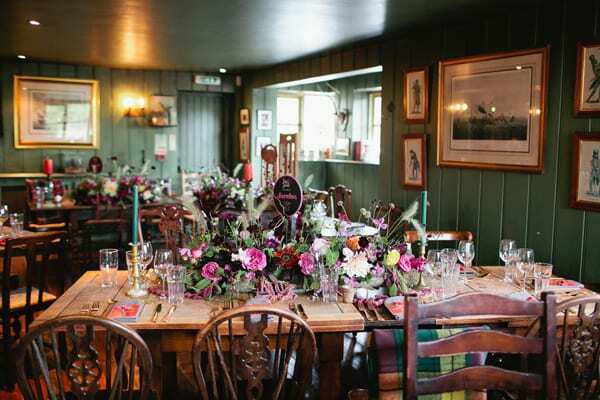 I wanted a palette that would be bright and seasonal, yet not distracting against the dark wooden tones of the room at The Anchor Inn in Lower Froyle, where we held the breakfast. Overall, I was really happy and our guests enjoyed taking the flowers home. Thank you so much to Jay for allowing me to feature her wedding photos. Isn’t her dress just incredible?! P.S. 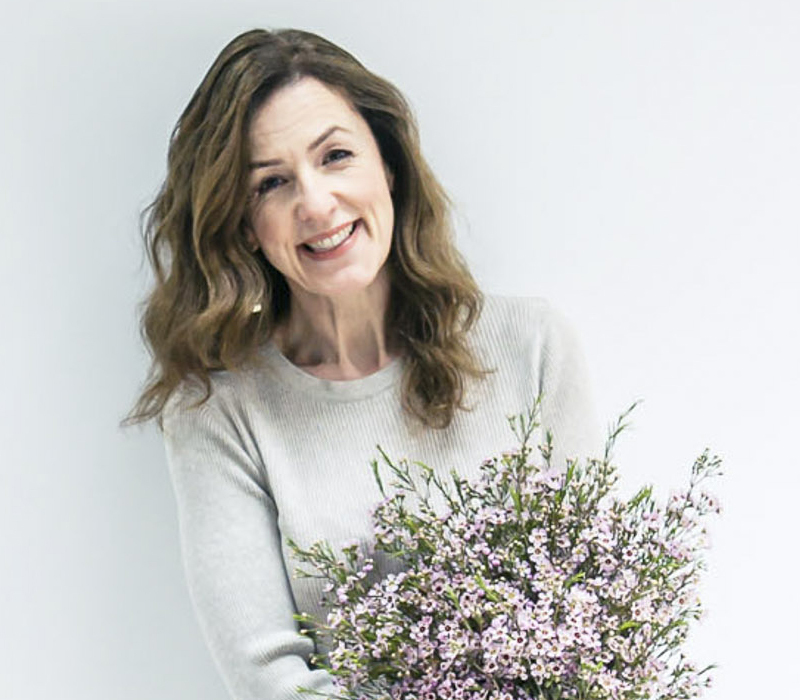 Jay’s taking part in British Flowers Week next week and you can read all about her involvement in my recent blog post. Thanks so much for the feature Rona, we’re so pleased. We loved our day and all the people who helped make it so special- friends, family and suppliers alike. This is the icing on the cake.